Cafe & Bar in Estepona Asking Price € 32,000 leasehold Café Bar in Estepona Excellent location on the promenade Large terrace for 12 tables This is a wonderful opportunity to purchase a café bar with an excellent location on the promenade of Estepona main beach. The bar has been completely renovated in June 2018 with new equipment providing offering a new owner a ready to go business in a highly sought-after area. The café bar has an interior of 45m2 and terrace of 60m2 with 12 tables. The current owners trade from 5pm to 3am in the high season and 8am to 6pm in the low season. There is opportunity to increase turnover for a new owner by opening earlier in the summer months. In summer, the bar is run with a total of 3 staff and this is reduced to 2 staff in the low season. The low rent and overheads make this an ideal investment opportunity and would suit a couple looking to make their first start in this sector. The key advantage of this bar is the location combined with the large terrace and access to the beach and different activities organize by the town such as Virgen del Carmen day, Feria del Jamon, Mercadillo de Verano, Juegos de Niños en la playa and many more. The rent is just € 550 per month and the current lease has 2 more years to run and is renewable. There is an annual terrace tax of €400.00 Viewing Arrangements Interested parties are advised that this is a confidential sale and as such members of staff at the premises may not be aware that the business is on the market. No direct approach to the premises should be made and all viewings should therefore be arranged through the vendor's agents Business Broker Spain. Business Broker Spain will be happy to assist with flight and accommodation arrangements to facilitate a viewing and bi-lingual staff will be on hand when you arrive. Description New Development: Prices from € 268,000 to € 351,000. [Bedrooms: 3 to 4] [Bathrooms: 2 to 3] [Built Size: 140m2 to 187m2] Stunning contemporary Town Homes in Manilva, with unrivalled sea views! Offering a view like no other, this development is a unique development of 47 contemporary Manilva town homes, some with private gardens and others with a fabulous solarium just five minutes from some of the best golf courses in the area including the world famous Valderrama in Sotogrande. Set in a prominent position just a few minutes away from the world class marina town of Sotogrande with Gibraltar and sporty Tarifa around a 25 minutes drive. It’s all about location and these prime properties are perfectly positioned for enjoying the luxury lifestyle of the Costa del Sol with the luxury resort of Marbella and the pretty port of Estepona around 20 minutes away Manilva is located on the south western side of the Costa del Sol and divided into 2 very different halves. On one hand it is a charming beach resort, yet just a few miles inland, there is a picture postcard cliff side white village. It’s popular with those looking for a quieter more traditional feel, yet close enough to the lively bustling resorts of La Duquesa Port and Estepona. It is also an excellent location for golfers, as it is close some of the Costa del Sol most prestigious golf courses, including the world famous Valderrama at Sotogrande. The chic three and four bedroom contemporary Manilva town homes are designed to make a statement. They feature clean lines and are light, bright and airy allowing natural light to flood in throughout. An open plan lounge and dining area and fully fitted kitchen with high gloss units enjoy garden views with large glass doors leading out onto a generously proportioned private terrace where dining alfresco will be the norm. A clever use of natural tones and textures throughout add to the high quality modern feel of the design. Bedrooms feature fitted wardrobes and the spacious master bedroom has a stylish en-suite and hidden dressing area with doors that open out onto a balcony enjoying spectacular views out to the Mediterranean and Gibraltar. Up on the roof terrace you can enjoy more fabulous views and relax in privacy soaking up the Spanish sunshine. The 4-bedroom Manilva town homes have the option to feature an extra room on the top floor that could easily be turned into a gym, office, hobby room or playroom. The development is perched majestically on a hill top offering panoramic views of the Mediterranean and Gibraltar. The location of this stunning spot provides a peaceful and relaxed way of life and the beautiful beaches of this stretch of the Costa del Sol can be accessed by a footbridge. Ideal for cycling, long walks and of course golf. Gibraltar is only 25 minutes away and this development is perfectly placed for those that work there. Description New Development: Prices from € 435,000 to € 1,350,000. [Bedrooms: 3 to 6] [Bathrooms: 2 to 5] [Built Size: 179m2 to 237m2] The development is located in Sotogrande, the most prestigious private residential area in Spain and an exclusive destination for the most discerning client. Situated on the Mediterranean coast, in the municipality of San Roque (Cádiz), this high-end residential complex is bordered by Los Alcornocales Natural Park and the mouth of the River Guadiaro. Thanks to its location, perfectly well communicated, it is possible to enjoy privileged weather coupled with a wide range of dynamic leisure activities to choose from. The marina and yacht club, restaurants, shops, golf courses, and many other sports facilities are just some of the possibilities Sotogrande has to offer. 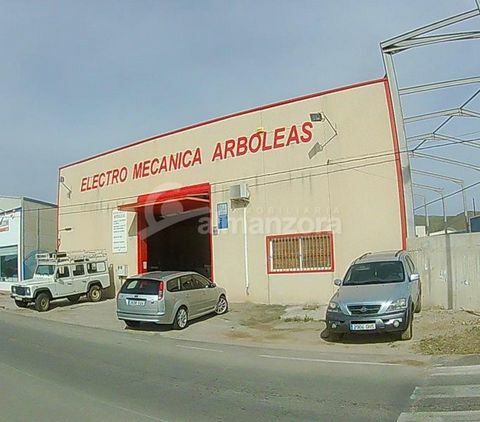 A well established garage for sale in a good location between Albox and Arboleas. The workshop is fully equipped and the business has a regular and strong customer base.Fully registered,the garage area is approximately 338 m2 and also has two offices with a waiting room,and two washrooms. At the rear of the workshop there is approximately 659 m2 of land.Situated on a popular Industrial Estate in a good catchment area between the towns of Albox and Arboleas and beyond. Description New Development: Prices from € 375,000 to € 948,000. [Bedrooms: 3 to 4] [Bathrooms: 2 to 3] [Built Size: 116m2 to 158m2] Set in one of nature’s most inspiring places on the coastline of southern Spain overlooking the renowned El Chaparral Golf Course this prestigious Resort & Club is a paradise waiting to be discovered. This exclusive resort serves to create balance between your mind, body and spirit under the balmy Mediterranean sun embracing the luxury concept of resortstyle living where your every need is met. Situated on the Mediterranean coastline of the Costa del Sol, long loved by discerning buyers for the plethora of outdoor activities to be enjoyed, this development is ideally situated close to some of Spain’s beautiful white sandy beaches and is bordered by El Chaparral Golf & Country Club. In addition the popular town of La Cala is a few minutes’ drive away famous for its fine dining and Blue Flag beaches. Set in a prominent position this elegant development boasts contemporary architectural lines that blend naturally into the environment. The stunning beaches of the area are within walking distance making this the perfect spot for enjoying every aspect of luxury living on the Costa del Sol with health club, spa and an exclusive concierge service to ensure your every need is met when you own a property at this development. This development is a unique development of exclusive three and four-bedroom town homes boasting spectacular sea views, contemporary architectural style and the latest in-home technology. These luxury properties offer well-distributed interior spaces where living area, dining area and fully fitted kitchen with breakfast bar blend into a living space that maximizes views from over-sized triple aspect doors and windows. Connection between outside and inside space is seamless with generous covered and uncovered terraces – the perfect place to relax and enjoy the views overlooking the golf course or the south-western coastline onto the Mediterranean Sea. Each of the residences are finished to a very high standard befitting a property of this caliber with porcelain flooring and neutral tones and textures throughout allowing the owner to personalize the space to create the perfect living environment. Spacious bedrooms benefit from fitted wardrobes with the master suite boasting a walk-in closet and beautiful en suite. Outside manicured gardens envelope a private pool in some properties – a place to cool down after a game of tennis or a day on the golf course. LOVELY 6 BEDROOM COUNTRY PROPERTY - GREAT POTENTIAL FOR HOME AND BUSINESS - ALHAURIN EL GRANDEThis lovely spacious country property is made up of a comfortable and beautifully maintained main house and two separate and self contained guest houses.It is in the prestigious area of Las Lomas only 10 minutes from the lively towns of Alhaurin El Grande and Coin and with stunning views of the beautiful Guadalhorce ValleyThe property sits behind a solid wall and is accessed through electric gates. The main house which is presented in excellent condition is built over 2 levels and comprises a large modern fully fitted dining kitchen opening onto a beautiful private courtyard garden perfect for al fresco dining a large living room with feature fireplace and dining area,3 bedrooms including the master en suite and 2 guest bedrooms sharing a large Jack & Jill bathroom with shower and bathtub. Completely separate from the main house is a large guest house which has a spacious living room with open plan fitted kitchen, a separate utility room, 2 spacious bedrooms and a large full bathroom. Overlooking the lovely grounds is another guest cottage which has a small kitchen and living room, a double bedroom and a shower room. Each of the properties has its own private terrace area and independent access..There is good sized, private pool with ample terrace, a shady sitting area,a barbecue area and a large poolside shower.The property sits in a large plot backed by mature eucalyptus trees ensuring privacy. The land is mainly olive trees so is low maintenance and is a peaceful and relaxing garden area. There is a table tennis area and a bowls area.and a large utility/storeroom.This lovely property must be seen to be appreciated.It would be ideal for a large family or perfect as a holiday rental business. It is on the market at a very competitive price and early viewings are recommended. ALHAURIN EL GRANDE.Alhaurín el Grande is a lively Spanish town located in the province of Málaga set in the most stunning of mountain scenery; positioned on a wide and open fertile plain surrounded by majestic mountains. It sits in the beautiful Guadalhorce Valley surrounded by orange, lemon and avocado orchards and historically was a typically Andalucian farming community. Today however the combination of a wonderful climate, easy access to the coast and a warm welcoming environment have made the town a popular choice for many ex pats from Northern Europe. Despite that the town has lost none of its Spanish identity and is an attractive town and an ideal location for those people who want to embrace the Spanish lifestyle without being remote or cut off. The town has many excellent bars, cafes and restaurants which are good quality and inexpensive , there are a banks, supermarkets, shops, a brand new modern library and a modern well equipped health centre and plenty of attractive outdoor spaces squares and parks to enjoy. Malaga airport is 25 minutes drive away and the lovely beaches of the Costa Del Sol only 30 minutes drive on excellent roads through some of the most stunning countryside to be found anywhere.There are 2 golf courses only 15 minutes away as well as tennis courts and gymnasiumsAlhaurin El Grande quite literally has everything needed for a comfortable, convenient and very enjoyable life in the sun-the perfect compromise between a rural and a resort - far enough away from the hustle and bustle of the coast to enjoy a more relaxed way of life yet close enough to enjoy a day on the beach whenever you feel like it. This Quality Property is a beautifully presented and successful 5 bedroom, 5 bathroom Rural Bed and Breakfast situated on a generous 5,784m2 plot in a stunning location close to the lively town of Martos in the Jaen region of Andalucia. Boasting superb outside spaces including a large swimming pool, barbecue, alfresco dining / lounge area and private gardens from where you and your guests can enjoy the warm sunshine of southern Spain and the laid back lifestyle of inland Andalucia. Ideally located for Guests to explore the wonderful Natural Parks and countryside of inland Andalucia and the cities of Jaen, Granada and Cordoba and having 360 degree views over olive groves and to the mountains beyond. The property has 3 en-suite quality double bedrooms on the first floor plus a large guest lounge with a feature fireplace / wood burner and a 4th bedroom being used as a dining room at present. The owners separate accommodation includes a high specification modern fitted kitchen open plan lounge / dining area, a ground floor double bedroom and access to your private large sunny terrace for alfresco dining with those dramatic views over the Andalucian countryside plus there is a summer kitchen / barbecue room. This Bed and Breakfast is a fully registered Casa Rurales with a highly rated 9.5 Guest review score on Booking.com and being sold fully furnished with its own excellent Website you will not be short of paying Clients from day one. This is a wonderful opportunity to experience Spanish living in an elegant and comfortable lifestyle whilst enjoying a good income from your quality spacious property and extensive grounds. Rural hotel complex with separate three-bedroomed house for the owners. Set in a tranquil location yet within very easy reach of Granada, the coastal beaches of the Costa Tropical and the ski-station of the Sierra Nevada. The complex is fully functioning but has the potential to be even more successful with an upgrade to the existing accommodation. The owners accommodation, which has its own entrance separate from that of the tourism complex, consists of lounge with wood-burner, fully equipped kitchen, pantry, three bedrooms, two bathrooms and outside terraces with a private pool. The rural tourism complex comprises four houses/apartments, each of which has its own private terrace and which is cleverly separated from the others by means of walling and gates. Three of the houses have lounge, kitchen, bedroom and bathroom and are designed for 2/4 visitors with a sofa bed in the lounge. The remaining house has three double bedrooms and two bathrooms as well as lounge, kitchen and pantry. All of the lounges have wood-burners, electric heating and two have air-conditioning. Available for use by all of the rental properties is the swimming pool (10m x 4m), barbecue, extensive terraces with great views, sauna, jacuzzi and, astonishingly, an astronomical observatory with powerful telescope. Services All mains services are connected. Location In the heart of the Lecrin Valley and only five minutes from the A44 motorway giving easy access to the principal tourist destinations of the Lecrin Valley itself, Granada, the coastal beaches of the Costa Tropical, the Alpujarras and ski-ing in the Sierra Nevada. Granada airport is 30 mins away and Málaga airport can be reached in 90 mins. Reduced by 200,000euros. Ideally situated alongside a popular tourist route this successful and well maintained complex offers 5 apartments and owner's accommodation. The main house has an attractive reception/ residents restaurant and bar, a kitchen, TV room, pantry and bedroom with shower/wc and a Storage/Linenroom. On the upper floor is the owners apartment with entrance hall, living room, bathroom with bath/toilet, bedroom with air conditioning and a spacious covered terrace. A covered carport links to the separate building with 5 studio/apartments. There are 2 studio apartments with kitchenette, bedroom and shower room. A slightly larger apartment with kitchenette, bedroom and and bath, shower and toilet. A four-person studio with 1 separate bedroom., living area, kitchen and bathroom with shower, bath and toilet. A four-person apartment with two separate bedrooms, living area, kitchen and bathroom with bath, shower and toilet. To the side of the main building is a large laundry room and a shed which houses the water deposits, and a run and coop for the chickens. To the rear of the main house is a large fully enclosed courtyard garden with vegetables and fruit trees, seating and a large table in the middle and a BBQ. The pool is 10×4 meters and is in a pretty landscaped area with a bar and plenty of space for relaxing round the pool. At the entrance an area has been specifically created with space for 8 Motor homes or caravans. There is also ample parking for 5 to 10 cars. The accommodation can cater for up to 14 people. The 5000m2 plot is fully fenced and gated and surrounded by open countryside and views to the mountains. The sale includes the complete business, website, goodwill, and the S.L. Company. This complex of three buildings, a main house and two separate one bedroom bungalows has been exquisitely designed and fitted to create a welcoming and nourishing health centre. It sits in an idyllic hillside location. The main house of approximately 150 m2, consists of a large kitchen, lounge, dining room, massage room, sauna, three feature double bedrooms each with its own generous and often quirky bathroom and private terrace. All rooms are air-conditioned and there is wifi throughout. At first floor level there is a large balcony which overlooks the rear of the property. The second house has a lounge/diner, kitchen, double bedroom and bathroom. The third building is another beautifully appointed one bedroom apartment, with bathroom, kitchen, lounge/diner and terrace, beside which is the swimming pool. Surrounding the buildings there are mature gardens and there is even a designer kitchen garden with raised beds. On a slight rise above the houses there is a tennis court and opposite this a parking area. Access is by a track which is passable in an ordinary car. The property is set in an olive grove of some 5 hectares, 4 hectares of which are still given over to productive planting. This property would make a wonderful family home with extra accommodation for friends and family or it could continue as now as a profitable business with the owners living in one of the smaller houses. In high season the property can generate €4.000 per week in rental income. Services All mains services are connected. 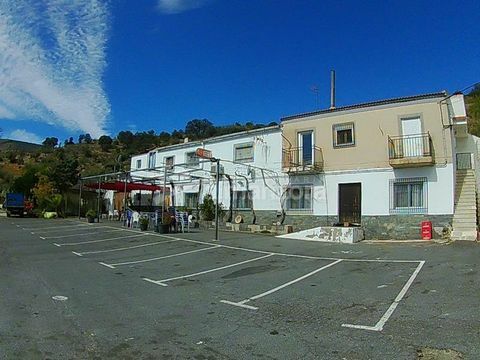 Location The property is situated just a few minutes drive from the thriving town of Álora with all local services and within easy access of the lakes at El Chorro. Málaga and its airport are just 45 minutes away. This property would be ideal for anyone wanting to set up a business, located on the main street of the Albayzin this bar is fully functioning and provides an income. Upstairs is a spacious two bedroom apartment. Downstairs, there is a bar, with a fully fitted kitchen and two WC. Upstairs is a two bedroom apartment with a fully fitted ktichen and bathroom. Services All mains services are connected. Broadband internet is available. Location The property is located on the main street of the Albayzin, close to all ameneties. Classical B&B for sale Asking Price €360,000 Freeehold Close to typical Spanish town Competa Owners accommodation included Early viewing recommended This 7 bedroom 6 bathroom B&B follows a traditional rustic white townhouse design with wooden windows, beamed ceilings, internal shutters and terracotta tiles. The guests area consist of 4 en-suite rooms, 3 regular doubles and 1 double with private entrance and ante chamber that can sleep one more or can be used as a private lounge for longer term guests, there is also a reception area an indoor breakfast room and finally the gem of the property, the rooftop. The rooftop consists of 3 interconnected terraces allowing for all guests to have their own individual private space or share together and enjoy alfresco breakfasts and/or lounging, but everything revolves around the plunge pool with views of all Competa and the grape/vid planted hills and on clear days, the sea! The owner’s acommodation consist of 3 rooms, kitchen, laundry room, lounge, main lounge and 2 bathrooms. There is the possibility of adding a 5thguest’s room with en-suite bathroom, the cost/quote received by the owners was for 5-8K depending on materials so easy to increase the income potential. Competa enjoys year round trading due to the many activities offered by the area, it’s very attractive to Dutch, British and Finnish tourist but like any village in Andalusia it receives constant influx from over 40 nationalities year round, the business is highly ranked on several review sites as well as having recently received the trip advisor certificate of excellence. Viewing ArrangementsInterested parties are advised that this is a confidential sale and as such members of staff at the premises may not be aware that the business is on the market. No direct approach to the premises should be made and all viewings should therefore be arranged through the vendor's agents Business Broker Spain.Business Broker Spain will be happy to assist with flight and accommodation arrangements to facilitate a viewing and bi-lingual staff will be on hand when you arrive. Great local for sale to invest in Marbella. Located in Málaga. Good option to invest in the center of Marbella. An international first-class coastal destination. In the second line of the beach, just 20 meters from the promenade we find this place. The premises of 395 m2 are divided into 2 floors as follows. The one that gives to street is a space of 335 m2 and the inferior one has a zone divided of 60 m2 for terrace. The whole needs a reform and it can be ideal to be divided and rented or sold separately, there is a blueprint that shows this possibility. In the center of Marbella This place is very well located in the center of Marbella, just 20 meters from the Paseo Maritimo. Marbella is a prestigious municipality in the south of Spain, on the Costa del Sol. A summer resort for the international jet set for the last fifty years. Protected by the mountains of the Penibética mountain range, it creates a microclimate that produces annual temperatures of 18ºC and where it is possible to enjoy 2900 hours of sunshine per year. A time that invites to disconnect the 27 km of coastline that form 24 beaches of moderate waves and golden fine sand. An incredible opportunity to own a modern freehold 9 Bed & Breakfast plus a 200 seater bar-restaurant. All rooms are en-suite with air-conditioning and Wi-Fi. There is also an owner´s penthouse with hot tub & plunge pool on the huge roof terrace, parking for 100 cars and a direct train service to Málaga. The quality is first class and the industrial kitchen is brand new and has all the modern accessories. The large bar area has a refrigerated tapas display, a games area and client´s lavatories (including disabled access). It was originally on sale for 1,300,000 but has been considerably reduced in price. Location: Close to Town Parking: Off road parking Garden: Private Orientation: East Aluminium windows Bar Close to all Amenities Cold Room Dishwasher Double Glazing Dryer Easily maintained gardens En suite bathroom Excellent Condition Games Room Guest Apartment Guest House Ideal for Country Lovers Investment Property Jacuzzi Kitchen diner Large Storeroom Microwave Near Transport Roof Terrace Sunny terraces Walking distance to t. centre Washing Machine Pool: No Pool Kitchen: Fitted Kitchen. You can find many more perfect properties in Alora .Spain and surroundings on our website. IMMO ABROAD is the specialist in finding, buying, selling or renting your home abroad. Find the best villas, apartments, houses, farmhouses within your budget. You will find IMMO ABROAD estate agency offices in more than 450 popular holiday destinations around the world, IMMO ABROAD is your partner for your home abroad. Our multi-lingual team assist you in your language for a state of the art customer experience with no space for errors, We assist you not only during your purchase or rental booking process but long after this, our staff is ready to help you anytime. Feel relaxed with our expertise and service, We are IMMO ABROAD your dream home is our passion! PRICE REDUCED FROM 890.000€ TO 765.000€ Bargain Boutique Hotel recently refurbished near beach & Marina Duquesa. 10 rooms all with bath plus top floor large apartment, 2 restaurants, 2 large indoor patio ideal for parties and celebrations. Large kitchen, bar area with direct access. Hotel Restaurante has easy access to the highway N-340 and offers 24-hour reception, an on-site restaurant, free WiFi and free parking on site. Playa La Duquesa Beach is 200 m away, walking distance to La Duquesa Golf Country Club and amenities. Housed in a building of 19th century, all rooms comes with a flat-screen TV and a private bathroom with free toiletries. All have a kettle and a small dining area. The restaurant serves traditional dishes of the area; and barbecue facilities are available. Other facilities offered at the property include meeting facilities, a shared lounge and a tour desk. An array of activities can be enjoyed on site or in the surroundings, including golfing. Malaga Airport is 75 km away. Property holds opening license. Price is negotiable. Puerto Banús is one of the most exclusive residential and commercial areas in Marbella and one of the main tourist destinations for high society in the world. In the streets surrounding the port there are excellent shopping centers and supermarkets. There are approximately 11 commercial centres in Puerto Banus and Cristamar is one of the shopping and commercial malls in that area. This local of 32m2 is situated in the Cristmar building and is being sold at an excellent price.